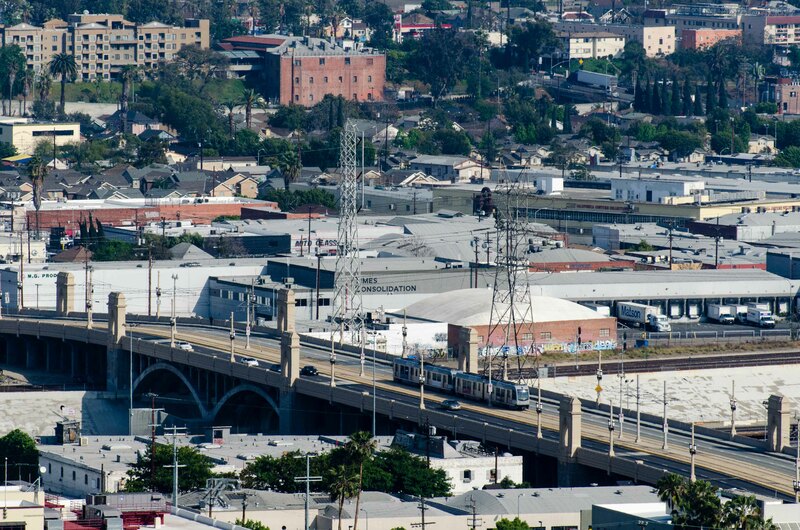 ART OF TRANSIT: The Gold Line crosses the 1st Street Bridge; click to see larger. Photo by Steve Hymon/Metro. Jon Healey looks forward to gates being latched on the subway this summer, saying it’s about time people had to pay to ride trains in Los Angeles. A community meeting was held earlier this week to review plans to put Figueroa on a road diet and add bike lanes and pedestrian improvements for the stretch between Staples Center and USC. Among the predictable concerns: would losing a lane of general car traffic lead to more congestion in downtown? My three cents: is the status quo — basically having a mini-freeway cleave through downtown and South Park — really that great? Blogger Brigham Yen takes a closer look at the long, loud overpasses that carry 7th Street and Wilshire over the 110 freeway, neither of which could accurately be called pedestrian friendly. Brigham has a few suggestions, including planters and raising the railings. A lot of development has taken place on the west side of the 110 and connecting that area to downtown proper seems like a smart and humane move. Well duh. Who seriously thought that the honor system would work? Well at least Metro finally figured that out. And it only took 20 years? Maybe in about another 20 years Metro will figure out that making the stations themselves a money maker by renting out vast empty spaces they have to businesses is a smart idea to help the station pay for itself in maintenance costs, hiring janitors to clean the place everyday, staffing security officers, and have onsite Metro staff. Gee, what’s that strange concept called? It’s called making profit and reinvesting them into making the place better. It’s how shopping malls and airports operate. Love the idea for bridge improvements. The planters could be fully prep’ed off site and delivered in one over-night session. The railings could be a project that takes one weekend per side. Lake Avenue at the Gold Line station has planters, good fences, and artwork. It is a good example of a better pedestrian experience. Actually what has happened is that everyone now has to TAP, even those who bought a day, weekly or monthly pass and are boarding a rail line. That doesn’t represent a revenue increase at all. I’ll believe that there’s a significant revenue increase when I see an audited financial statement. Why did Metro even bother with the honor system? When Metro opened the Blue and Red Lines back in the early 1990s, did anyone in Metro stopped to think the honor system was a stupid idea? I mean seriously, there has to have been a meeting inside a conference room about this right? No? You have to wonder if Metro has a deficiency in common sense or something. Gate latching at only the Red and Purple Lines does not solve our problems. If gate latching is to be done, it has to be done system wide. What is Metro’s plans to expand gate latching to all the other stations on the Blue, Expo, Gold, and any other lines and stations that we may build in the future? What some commenters here are calling the “honor system” is actually a proof-of-payment system (“trust, but verify”). We use it for income taxes, for purchases in supermarkets, and for many other things as well. Oh yes, and by the way, it is used on a very large number of other transit systems, in the US and abroad. It is essentially the *only* system in use in most of Central, Northern and Eastern Europe. Look at the wikpedia page “proof-of-payment” for more. There are arguments for and against proof-of-payment systems. Paris has been gravitating away from it for its suburban rail network, recently installing gates at many stations. London uses gates on older lines, but proof-of-payment on newer lines. Berlin and Brussels have not felt the need to install any gates at all. Closer to home, the same holds for San Diego, Portland, Seattle, Phoenix, Denver and Salt Lake City: no gates, and yet the system works just fine. Say what you like about proof-of-payment, but the idea that it’s clearly a silly thing to do would come as a big surprise to much of the world. Proof-of-payment is another way of saying honor system. They both mean the same thing. “Trust, but verify” but verify when we have the resources to hire officers to check them everyday. Sorry we don’t have that luxury in our budget crisis. Your argument can be said the other way around. San Francisco, New York, Chicago, Boston, London, and a lot of other cities uses gated systems. Why do these cities use them? As a city, Los Angeles has a lot more in common with these places than Denver or Salt Lake City. Complainers only see the picture and uses examples to their benefit. They don’t see or ever explain why the other cities that uses a gated system. Locked gates are a proof-of-payment system. It just replaces expensive human fare checkers with more efficient gated machines. LA can’t afford staffing multiple fare checkers everyday across all of our stations. It costs too much in labor cost. Humans also complain and ask for things like benefits, pensions, vacation pay, sick leave, etc. Machines do the same job without such hassles. Let them handle the task, machines are better at handling things more efficiently. Instead, use the humans to do more important matters like providing security to the area.